How Do You Mourn The Living? If you’re a fairly regular reader here, you may have noticed that I don’t often mention my dad, and when I do it’s always in the past tense. He’ll sometimes come up when I write about my childhood, but other than that I almost never talk about him. He’s not dead or anything – in fact, he lives in the same city that I do. He’s just not a part of my life. A few years ago my father became estranged from my sisters and I. There’s a lot of backstory there, but I’m not going to get into the whole thing here. For one thing, it’s not entirely my story to tell. For another, I don’t want to write anything here that might hurt anyone. So I’ll just say that there was a long, protracted leave-taking that involved a lot of tearful discussions, tentative reconciliations, and a slow, steady breaking of my heart, with the outcome of all that being that he is no longer a presence in my life. I love my father immensely. We were close when I was a kid, and I have about a billion memories of us being hilarious and fun together. When I was a teenager, he was the cool parent and would buy me beer and drugs when I came to visit him. He taught me about existentialism, and encouraged me to read Camus’ The Outsider (his favourite book) for my big, final high school English paper. We shared a love of music, and from him I learned the deep physical pleasure – the sort of secular reverence – one experiences while placing a record on a turntable and dropping the needle into the groove. He was a great storyteller, and listening to him geek out about our family history was one of my favourite ways to spend an evening. 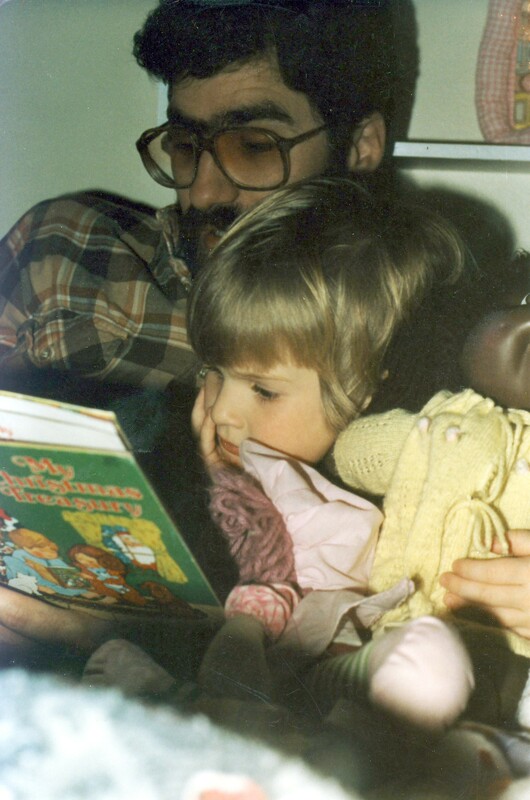 He read to me every night when I was a kid, even once I was old enough to read on my own, and would get grumpy if my mother had to read a chapter to me while he was working late because he always became just as involved in all my favourite books as I did. He would play make-believe games with me for hours on end, something my mother, bless her, didn’t have the patience or imagination for. He was the first person to talk to me like I was a living, breathing person with thoughts and feelings of my own. We shared the same dark sense of humour; maybe we still do. He loved me. I know he did. I’m sure that if you asked him he would tell you that he loves me still. So how do I reconcile that with the fact that he’s hurt me, badly, and has hurt many other people that he cares about? It seems impossible. You always read about little kids who blame themselves for their parents’ divorce. I was thirteen when my dad left, and was sure that I was old enough to know that sometimes grownups just fall out of love and that’s how life is. I knew that it had nothing to do with me, or my sisters. People change, and my parents had changed in ways that made them incompatible with each other. Case closed. Time to move on. But lately I’ve been wondering if that’s really what I believe; I wonder if I’ve ever felt entirely blameless. Because, honestly, couldn’t we have done something more? Couldn’t we have charmed him into staying somehow? If only we had figured out the perfect way to be, the way that always made him happy, then he wouldn’t have left, would he? But we could never quite suss out the secret of making my father happy. Or maybe we just didn’t try hard enough, because we didn’t know exactly what was at stake. We never imagined that he’d leave. And then, years later, he somehow managed to leave again. And I’m left sitting here trying to pick up the pieces, trying to figure out how to live my life without him. And it’s hard. I told my therapist that it would, in some ways, be easier if he was dead. Not that I wish that he would die or anything, just that I would know the right procedure to go through. I would wear black. I would mourn. I would recall only the happy times. I would keep a picture of him on the wall, and my eyes would well up with tears whenever I saw it. I would love him, perfectly and unconditionally, the way you’re supposed to love a parent. I would know that he’d loved me. But how do you mourn someone who’s still alive? How do you grieve the fact that they’ve left you, when at any moment they could walk back into your life? How is it possible to feel so angry and so hurt and yet also so hopeful that things might get better? It seems totally self-contradictory. And yet, here we are. But the truth is that I don’t know how we could ever figure it all out. Not at this point. We might reconcile someday, but our relationship will never be what it was. How do you grieve a relationship that can’t ever be properly resuscitated? My father has met my son twice. The first time was on a rainy day when Theo was about four months old, we ran into my father on the street corner. He peered through the stroller’s rain shield at my fat, sleeping baby and said that he was cute. He shook his head and said that he couldn’t believe he was a grandfather. He promised to call me. He didn’t. The second time was when Theo was two. My sister and I had agreed to have coffee with our father, and then out of the blue I asked if he wanted to meet Theo. We all went to the museum together. Theo and my father had a great old time together, drumming out rhythms in the second floor gallery, choosing favourite fish in the aquarium. Afterwards, we promised to keep in touch, to try to set up another meeting. It never happened. These days Theo is very interested in familial relationships. He’ll sometimes refer to me as “your wife” when speaking to Matt, and he’ll call his grandmother “Anne’s mother” instead of Gran. So the following conversation was bound to happen sooner rather than later. Me: His name is F____. Me: Well, he lives here in Toronto, but we don’t get to see him very often for a variety of reasons. But I know that he loves you very much! Theo: … Is he not a nice guy? Me: He’s a nice guy. We – well, we just don’t get to see him very much. But he does love you. Because I’m sure that, in some way, he does. At the end of the day, I’m left wondering which father is my real father – the one who sat on the floor and played dolls with me for hours and hours, or the one who didn’t just flat out didn’t respond to the email announcing my pregnancy? The answer is both, I guess, but that truth is a lot to wrap my head around.